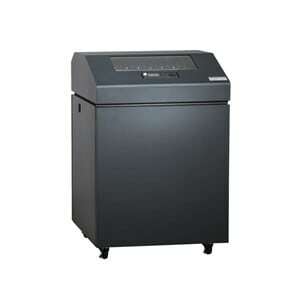 The TallyGenicom 6815 cabinet line printer prints up to 1500 line per minute. The TallyGenicom 6815 cabinet line printer is your choice when reducing noise within your industrial printing environment is an objective. With the 6815 Cabinet, TallyGenicom has designed a modular enclosure that improves reliability and reduces noise emission, making it ideal for office environments. It is the quietest and most versatile choice in our mission-critical line matrix printer series. This industrial-strength printer is ideal for noise-adverse areas running large, unattended print applications. Its genius lies in its design. The TallyGenicom 6815 cabinet line printer was configured to operate in a sturdy, fully enclosed sound-reduction cabinet. This model features the best innovations from the previous series, which allow users to customize the TallyGenicom 6815 cabinet line printer for specialized printing needs. Like all printers in the 6815 series, the Cabinet is ENERGY STAR® qualified and ready to plug into your network and start printing from day one. Get more printing done in less time. PowerPrint™ delivers improved print clarity and print darkness on multi-part forms by increasing impact energy. PowerPrint is a standard feature on 6815 printers with a 1,000 line-per- minute print speed. Manageable Savings. The 6815 Cartridge is a smart purchase.